JTM | What Does JTM Mean? JTM means "Je t'aime, which is a French phrase meaning "I love you" in English. Whilst saying "I love you" in English is usually indicative of very strong romantic affection, the use of the abbreviation JTM between English speakers should not always be taken literally. In French, the abbreviation JTM may be used between lovers, but can also be used in a playful way to show affection rather than actual love. "Je t'aime ("I Love You)"
David: Goodnight darling. I love you. Helen: Goodnight my love. JTM. Mike: Looking forward to seeing you on Saturday. JTM is an initialism abbreviation. Technically, this means it is pronounced using its individual letters (i.e., Jay Tee Emm). However, it is not often uttered using its letters, as it is used for efficiency in writing and not efficiency in speech. Between native French speakers, the abbreviation JTM is likewise only used in writing. 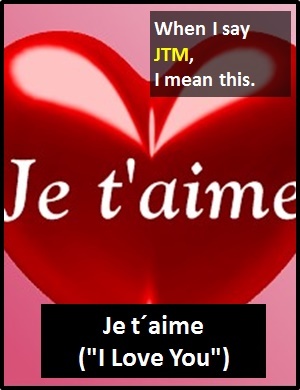 The abbreviation JTM is normally used as a standalone declarative sentence (i.e., a statement) with the meaning "Je t'aime" ("I love you"). JTM is not often used as another part of speech within a wider sentence. Before the digital era, we might have said something like "I love you" instead of using the abbreviation JTM.